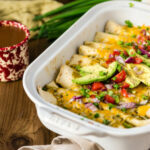 Crazy easy make ahead sausage and egg stuffed enchiladas smothered in a delicious salsa verde! Serve for the perfect breakfast for a hungry crowd. Heat the bacon dripping in a large skillet over medium heat and swirl to coat the pan. Add the onion and pepper and sauté until softened, 5 to 7 minutes. Add the ground sausage and cook, breaking into small pieces, until browned all over. Drain any excess fat, if needed. Add the red pepper flakes and diced jalapeños. Remove the sausage mix from the skillet and set aside. Whisk the eggs in a bowl until thoroughly combined. In the same skillet, reduce the heat too low. Add the eggs and scramble until almost set. Remove from heat. Spoon a thin layer of the salsa verde over the bottom of a large baking dish. Working one at a time, add the tortillas to the dish, filling with evenly with sausage mix, scrambled eggs, and a sprinkle of black beans. Roll, tucking the edges towards the edge to keep each tortilla from unrolling. Repeat until you have filled the baking dish. Pour the remaining salsa verde over the top of the enchiladas. Sprinkle with pepper jack and cheddar cheese. Bake for 30 minutes, until the cheese has melted and tortillas are becoming golden along the edges. Remove from oven and let sit 5 minutes before serving with tomatoes, red onion, scallions, diced peppers and sliced avocado.